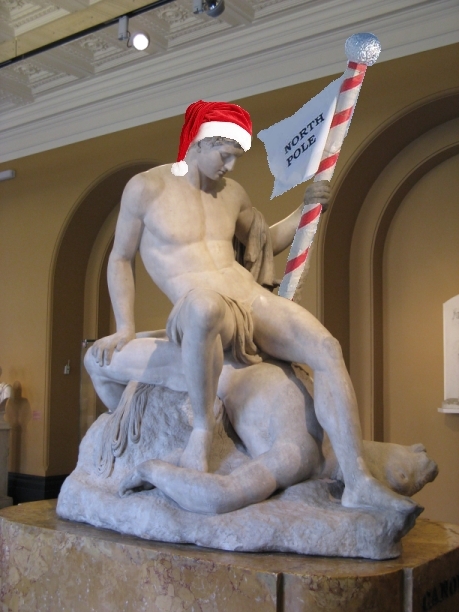 Good To Begin Well, Better To End Well: Holiday Hiatus with Santa Theseus! Is that anything like Santa Wanax, who knows who's been obedient, who's been naughty, and who'll be sacking your town? Amalia, first of all you're a darling and I love you so much. SO much. <3 Thank you for celebrating my cover reveal day with me!!!! Timespell wouldn't exist if it weren't for you... now I can't wait for Forged By Fate's cover reveal when I can do the same for your most awesome book!! SECONDLY, Theseus is completely THE MAN in that image! Trinza completely outdid himself!! LOVE! I knoooooooowww! On both counts! And I have to agree that Santa Theseus looks like he is IN COMMAND. Which is nothing less than I would expect really! <3 <3 Love you too, my friend!! !